I knew it was coming. We needed it to happen. And yet, when it did, I felt overwhelmed with unexpected sadness, sobbing like a kid who just dropped her ice cream cone on the ground. We moved over a year ago, both for a job relocation for my husband and because we desired a larger city and better opportunities for our little girl. It was a rational decision. It was the right decision. However, it meant leaving a home that held 10 years’ worth of laughter, tears, parties, holidays, and everything in-between. It was where we had years of happy times with our sweet Cairn terrier, and where we had to make the difficult decision to let him go when we ran out of options to heal him. It was where we dealt with the pain of four failed adoptions, and where got the call that we were matched with our day-old daughter. It was where we brought her home to the excitement of our neighbors and friends. Fast forward 30 years, and we bought this lavender home. It was, in many ways, my dream home. 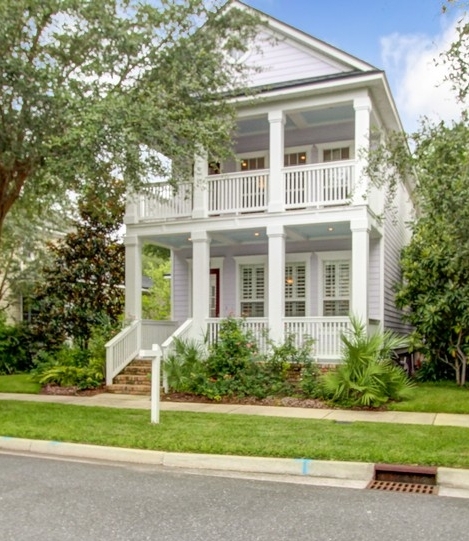 Architecturally, it looked like the homes I loved from family vacations in Charleston, South Carolina. We painted the fireplace a deep shade of raspberry and the bedroom an incredible, relaxing shade of celery green. It had high ceilings and custom drapes. I hand-painted the side porch to look like gorgeous Portuguese tiles. Moreover, due to my husband’s work, we’ve moved 16 times in 18 years of marriage, so this house, one we owned for 10 years, was the place that truly felt like home. We even rented it out for a year and a half for one of our relocations and happily came back to it as soon as we could. It was that place in the world that I felt safe and grounded, no matter what was going on in our lives. I was the place that, when I opened the door, I felt embraced. And now we’ve sold it to someone else, and I’m heartsick. In between wiping tears from my face, I realized that I needed to look at this as an opportunity for personal growth and awareness. In fact, I realized that the experience itself was challenging me to do what I have told so many clients to do—to take the time to grieve, because when grief is stuck inside your body and unexpressed, it does pretty bad things on every level. Step 1: Acknowledge the grief. Just to be clear, this is a word-for-word transcript of me beating myself up. I tell you this to show that even those of us that work ALL THE TIME to have empowering self-talk occasionally give in to negative and berating thoughts. It’s human nature. However, it’s important to recognize this when it happens and stop it in its tracks, because if we don’t, we end up shoving our grief deep inside. At that point, it becomes a “ghost in the machine,” gunking up our emotional, mental, spiritual, and physical selves in a negative way. That alone allowed me to feel better, but I had more to do. Step 2: Grieve the loss. Once I said that aloud, the floodgates opened and I allowed myself to cry until I felt like I was done. That last part is important, because I see clients all the time who did not allow themselves to grieve (or had too much to do in the moment to be able to grieve), and I see the damage it does to every part of their lives. One woman couldn’t grieve when her husband died because his family decided to accuse her of murder (seriously), because he’d never told them he had cancer. Shortly after his death, she developed a condition where she didn’t have enough oxygen in her blood and her chest felt tight all the time. Another man lost his job, but didn’t think it was “manly” to grieve about it, resulting in chest pains with no medical cause. 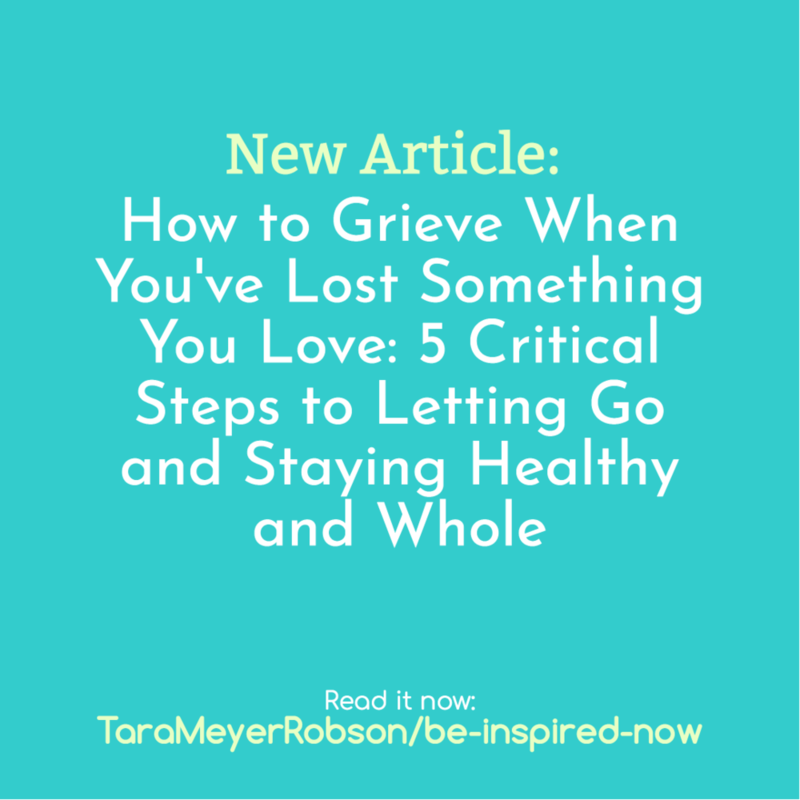 On and on it goes, from cardiovascular issues to respiratory issues to breast issues to depression, I’ve seen the ways that unexpressed grief shows up in the body; I knew I had to express it to clear it from my system. If you’ve got something you are grieving but haven’t expressed it, please take the time to do so. If it’s hard for you to do, one great way is to watch a sad movie and dedicate that time to allowing yourself to cry about your loss. This is especially helpful if you’ve locked that sadness down for a long time. By putting it outside of yourself in the form of film characters going through something sad, you can access that place inside yourself that needs a release. It’s a way of bypassing the conscious mind (which may want to keep the grief locked down) and tapping into the subconscious, where all those memories and sadness is held. After crying, I gathered myself up and headed off to the local botanical gardens. For me, there is almost no place that is more therapeutic than somewhere out in nature, with lovely flowers popping out of the ground. It instantly centers me and reminds me of the cycle of life and of potential blossoming out of the unseen. I realized that, with such tremendous change in the last couple of years, I had been holding on to that home as a safety blanket. My fear was that, if I let it go, I’d never have anything like that again. And, while we have a lovely home we are renting here, it doesn’t feel like home—it’s beige and gray and brown, and I am a bright colors kind of girl. But, when we grip on to anything out of fear, we can’t allow anything new (and maybe even better) to flow into our lives. In order to open to the possibility of better, we must let go and trust. In saying that, I realize how incredibly difficult that can be, especially if you’ve been through a great deal of loss or difficulty; needless to say, the desire to hold on to something that makes you feel steady is incredibly strong at those moments. Acknowledge that, too. It’s completely okay to feel the need to hold on; the key is to be aware and work on letting go and trusting. One thing that can help is to create a vision board of things you'd like to connect to in the coming months or years. It's easy to do; just go grab a bunch of magazines that speak to you and then look through them, cutting out images and words that feel inspirational or match things you'd like to have in your life. Arrange those images on a poster board or in a scrapbook in a way that feels creative and good to you. Then, look at those images each day, saying aloud: "I release anything I don't need in my life anymore to connect with these things that I desire. I am open to abundance/happiness/joy/whatever coming to me now." Make sure to connect with a happy memory before you do this; you want to connect the feeling of happiness with your vision board to help infuse your future vision with energy and faith that it can come in to being. Step 4: Perform a ritual to honor your loss. When someone dies, we hold a memorial service or funeral as a way of honoring the life of the person as well as honoring the loss of those left behind. However, we don’t think to do this for other kinds of losses, although it can be just as healing and necessary. I recently worked with a woman who had never truly grieved the loss of her mother, mostly because she was so exhausted being her mom’s sole caretaker in her final years that she was worn out by it all. She also carried a deep sense of guilt, that somehow she had not done enough for her mother, or that somehow there was one more thing she could have tried that would have saved her mom’s life. She had carried this deep burden for so long that she was seriously depressed, extremely anxious, and couldn’t speak about anything she was feeling without falling to sobs, hardly getting words out. Worse, she was about to interview for a terrific job right across the street from the facility where her mom had died, and she was so overwhelmed by emotion at being back at that space that she worried that she would be unable to do the interview without sobbing incoherently. It was clear to me that there were a lot of unresolved feelings around her mom’s death, and she had been clinging to those feelings and experiences so deeply that she was unable to move forward. I suggested that she drive to the parking lot of the facility where her mom passed away and to sit in her car and allow herself to grieve fully. Then, I suggested that she find a way to honor her mom’s life and to place that either in the facility itself, or just outside. She decided that, because her mom loved Christmas, she’d buy a Christmas ornament and place it in one of the trees outside the facility. Once she did this, she was able to feel that she had honored her mom and was able to let go of that old moment in time, freeing her to move forward with memories of her mom that were empowering and good. She finally felt that it was okay for her to let go of the pain and move forward with her own life. Even better, she was able to interview for the job in a centered, powerful way. Do you still have deep feelings of loss over something or someone? Are you dealing with a loss now? If so, my advice to you is the same: Find a way to honor that thing or person in a funeral-like ritual. I’ve had clients who have buried pictures of things, animals, or people they loved, wrote down all their feelings in a letter which they burned, and even finally found the courage to spread a loved one’s ashes in a desired location. I recently told a Jewish client of mine to make sure that she used a Jewish funeral/memorial ritual to release her mom in a positive way. The ritual itself doesn’t matter; it just needs to be significant to you and it needs to feel like you are honoring the loss in a powerful way. It's a good idea to think about your spiritual beliefs or practices and try to incorporate something that honors the loss in alignment with those beliefs. When you do that, you will feel a deep sense of peace and release. For me, I’ve decided to write a letter to our old house, thanking it for being such a wonderful place for us to call home for 10 years. I’m going to fold that letter up and tuck it in a folder with pictures of happy times there, like a little time capsule of gratitude. I have a real sense of peace and happiness now that I've made this decision. You'll know that you've found the right way to honor the loss when you feel that way, too. Step 5: Realize that the physical loss is a very real thing. I get it. On a spiritual level, our loved ones are still connected to us. On an energetic level, all their particles are going out to be recycled into things in life, from other people to stars to whatever we can imagine. You can know that intellectually. You can believe all of that deeply. You can even have signs that your loved one is still connected to you. And you can still feel knee-bending loss at the physical person (or thing) no longer being within reach. When it’s a person you’ve lost, you miss his or her hugs, the sound of his or her voice, the smell of perfume or cologne. You miss the way you felt when you were with them. For years after she died, I picked up the phone to call my grandma. After our dog died, I missed stroking his fur and feeling him tug excitedly at the end of his leash. Even for inanimate objects, our need to feel and sense them can be very real. In fact, over the time we’ve had the physical object in question, it’s created neural pathways in our brain that have mapped certain feelings and emotions to be associated with that place or interaction with that object. In the case of a house, you have a certain feeling associated with walking in to your bedroom or kitchen, and losing that physical connection (and the corresponding emotional response) can cause a deep sense of loss. Because of this, any physical loss is a real, tangible, and painful thing. It’s more than okay to acknowledge your grief at losing this; it’s absolutely necessary for your health. So, the next time someone tells you to just “get over” your loss of someone or something in your life, or ridicules you for the depth of sadness you feel at losing a familiar person, animal, or physical location, let it roll right off your shoulders. Let yourself grieve as you need to, and in so doing, honor your very human need to acknowledge the passing of one thing to the next in your life. Trust me, you'll be better for it in every way, and most especially, in your health and wellbeing. *If you are feeling overwhelmed by any kind of loss, please consider setting up a coaching session with me. I can help. I will understand. I will honor your loss. I will help you heal. Older PostAre you an Empath Entrepreneur? Don't miss this awesome FREE summit!